Nice Cabin In Covington Mill! Amazing home in the woods! This home is located in Covington Mill, a small mountain community close to Trinity Lake. 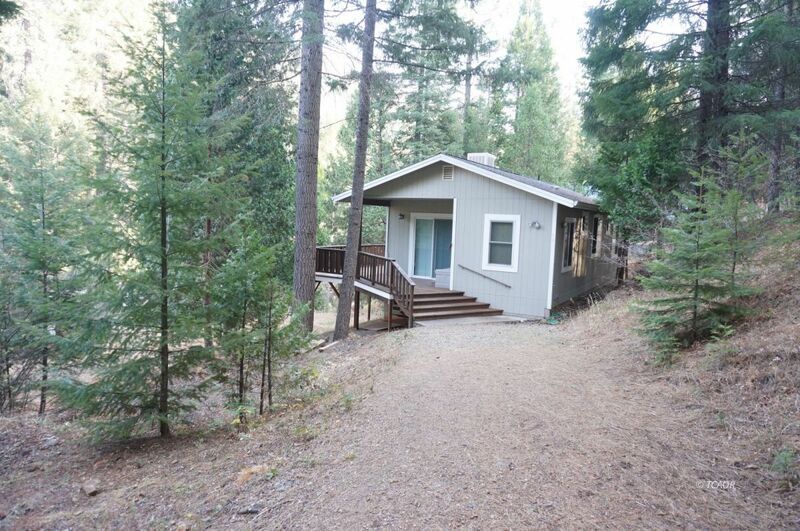 This home will a great primary residence, investment home, vacation home, VRBO or an Air B & B... this 2Bd/2Bt, 896 s.f. home comes with two separate parcels totaling .45 acres. The second parcel already had a septic system installed for a two bedroom home. In the existing home you will find efficient use of space along with custom features for comfortable living. 10 ft. Tall ceilings, large windows and 4, 8 foot tall sliding glass doors bringing the outdoors inside with views of the surrounding woods. Coming inside the charming home, you will find Stainless steel kitchen appliances, custom fixtures, recessed lighting, custom birch cabinetry and porcelain tile counters are some of the extras in this home, along with the propane fireplace, ceiling fans and wrap-around redwood deck. Also for extra storage, under the home has a large walk out unfinished basement. Come take a look! !